An awesome message about Blueprint Education to end the year. 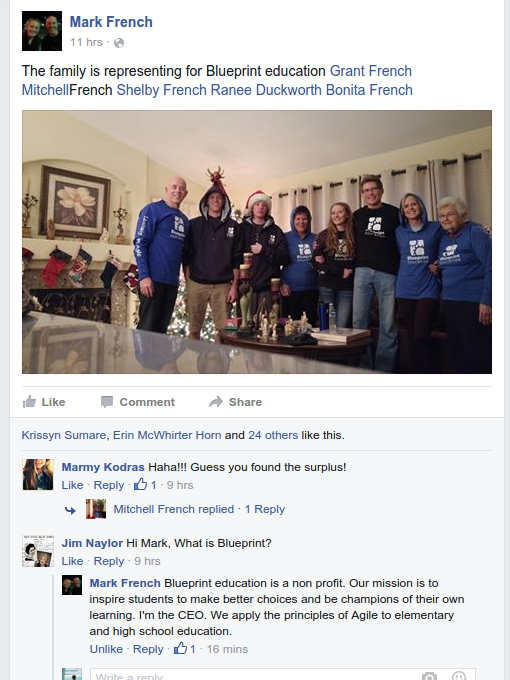 As some of you know, I have been helping out the amazing folks at Blueprint Education in Arizona. They have been making some changes to their culture as a follow-on to a previous introduction to new ideas introduced by John Miller from Agile Classrooms. I'm getting ready to relax until the end of the year and saw this message in my FB feed this morning and thought..... It would be really cool to share this to inspire others to perhaps try something new in 2016! "Blueprint education is a non profit. Our mission is to inspire students to make better choices and be champions of their own learning. I'm the CEO. We apply the principles of Agile to elementary and high school education." For me at least, this is one of the best messages I could have read all year. If what you read in some of the following posts inspires you, reach out to John Miller or Mark French. I know that either of them would be more than pleased to share what they have been up to or help you learn more about bringing Agile Values and Principles to your education system. There are some exciting things happening next year at Blueprint and I can't wait to start sharing those! Stay tuned. A major change in decision making approach. Labels: Agile , Blueprint Education , Scrum. Saravana Bharathi (@AgileKarma) shared the link at the bottom of this message today over at FB. Thanks !! The picture representations of complex mental thought differences are intriguing and simple to understand. Imagine if we could facilitate discussions toward commonality using this type of diagram? I wonder if one could facilitate a team to draw their own diagrams? I wonder if one could facilitate separate groups in an enterprise to draw their own diagrams to find commonality or places for discussion. One thing is for certain (to me at least). The simple diagrams convey a strong message without the need for a large, written report. I do have some personal reservations about this accidentally turning into a "categorize everybody into the same group" type thing. I do think if the diagrams are created by people as self-representations, stereotyping might not happen. I'm looking forward to trying something around this idea out. If anyone tries these diagrams out before me, please let myself (and the community) know how it works out! I recently spent days trying to solve a technical problem when attempting to auto-test a website on my Jenkins server combined with Selenium, Selenium Grid, or PhantomJS on the same machine. I figured out the solution and decided I would share it here should someone find themselves in the same or similar situation. These instructions apply to Jenkins but will likely also apply for Bamboo, TeamCity or your CI server of choice. When testing on a developer workstation, the site is started up and tested at localhost: (127.0.0.1). A Jenkins server which runs all tests locally instead of on slaves (the same problem would likely occur on a slave). Spent even more days reading about countless issues with dockerized containers working with Selenium. As it turns out, the problem is not related to Docker and Firewalls but the nature of containers. Change the tests to use the local IP address of the host instead. I used an environment variable to do this on the host. (code not perfectly formatted in this blog post). (where x.x.x.x. is the ip address where the LOCAL TESTABLE WEB PAGE is located in pre-production).